ActivJoint Review – Is This Product Safe To Use? ActivJoint is a dietary supplement that comes either in powder form or in capsule form. According to the producers, ActivJoint is conveniently packed to make it easier for consumers to take. Both the powdered form and the tablet form are designed to support joints, bones and ligament growth. Given it is replenishing abilities, ActivJoint is recommended for people who are actively engaged in sports or strenuous activities and manual labour. When taken as per instructions, ActivJoint has the ability to promote the formation of stronger connective tissue, promote mobility and keep your joints in a flexible and healthy state. This product can be readily purchased without any prescription in leading retail outlets and online stores. The official website doesn’t sell the products directly to the consumers but instead, they sell it to the retailers who then sell to the end consumers. This makes it difficult to enforce the money back guarantee. What is the Company Behind ActivJoint? 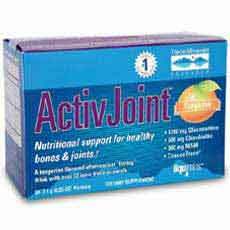 ActivJoint is a natural dietary supplement that can be bought readily without a prescription. It is designed to offer long time joint support by supplying the body with essential nutrients. According to the producers, ActivJoint is a result of a committed research that took hundreds of man power and thousands of dollars to complete. The product harvest the power of three of the most sort after ingredients used in dietary supplements. The producers claim that they have made this product appealing to vegetarians by choosing only plant based ingredients. As a show of confidence in their product, the producers sell this product with a money back guarantee provided that the customer returns any unopened bottle of the product. The producers are a company known as Trace Minerals Research (TMR). The producers claim that this company was founded with aim of creating all natural products that are safe and effective. TMR is behind several other all-natural supplements. What are the Ingredients Used in ActivJoint? Glucosamine – Glucosamine production in the body reduces with age. It is believed to promote cartilage repair and formation. Chondroitin Sulphate – It is highly hygroscopic and thus promotes joint lubrication by attracting fluids to the joints. MSM – This is our bodies’ source of organic sulphur. It is believed to fight inflammation, promote strong connective tissue and improve the immune system. Calcium – This is perhaps the most abundant mineral in bones and is responsible for creating strong bones and other support structures. Other ingredients include: Stearic acid, microcrystalline cellulose, croscarmellose sodium, calcium stearate, silicon dioxide. ActivJoint is designed as a long care product. Both the powdered and the capsule versions of the product have strong ingredients that are known to support the development of strong joints. The powdered version which relies on animal extracts packs glucosamine; a strong ingredient in the regeneration of worn out cartilage. Wearing out of the cartilage is a major contributor to joint related pain since it means that some joint parts grind against each other. The capsule version, or the vegan version of the product is fortified with two of the most sort after minerals. In a nutshell, this product aims at equipping your body with nutrients making it capable of replenishing itself. What are the Pros of ActivJoint? What are the Cons of ActivJoint? There are no known side effect associated with this product. In case you are allergic to any of the ingredients used in any of the two forms of the supplement, you can always switch the supplement accordingly. In case of severe allergic effects, consult your caregiver immediately. As to the best of our knowledge, this product is not a scam despite the fact that it might not work exactly as advertised. ActivJoint is a long term care product that aim at restoring the body’s ability to take care of your joint. This product is not exception in any way to most of the products we have reviewed. All the same, we feel that the company does very little to make the product better appealing to customers.